So, while I'm not a full fledged lip product addict like some of you lot are (y'all know who you are with your 50+ lip products...secretly judging you)(jks), there are a few lipsticks in my stash that are currently making me go "YASSSSS" every time I use them, so I thought I'd devote a post to them. I first heard about Lipstick Queen from Jaye, so when we went shopping in Convent Garden, I picked up 'Stoked' and holy frickcakes this lipstick JUST GLIDES ON SO SMOOTHLY THERE IS SERIOUSLY NO COMPARISON. Sheer, glossy, and hydrating; the only downside is that the brand isn't easily accessible in Canada. 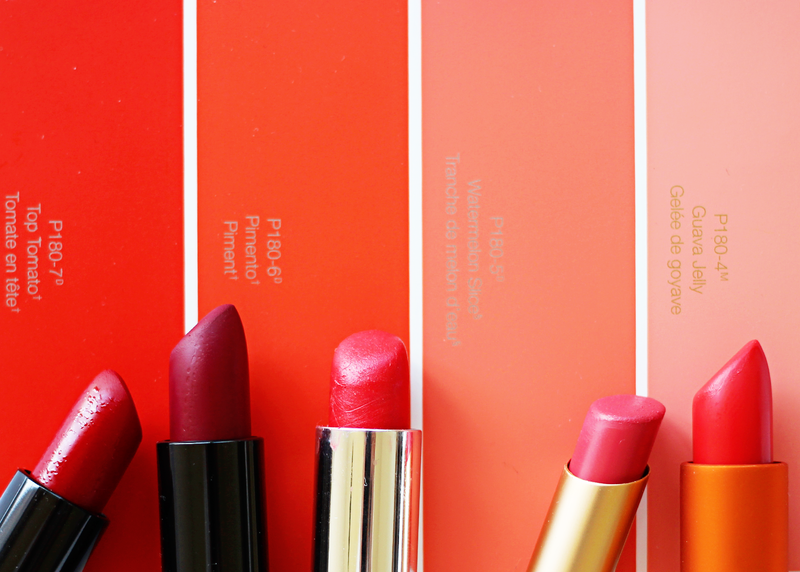 EXCUSE ME I RATION THIS GLORIOUS LIPSTICK AND LUST OVER THE OTHER SHADES. Korres 'Coral' is basically the same as 'Stoked', except more orange and pigmented, and you can also see this lipstick in action here. ANOTHER CORAL. DON'T JUDGE ME. 'Coral Fire' is my second Too Faced lipstick, and despite the name, it's not red, but rather a pink-coral. The formula is creamy and opaque in one swipe, the gold packaging is gorgeous, and I once got a compliment from my mom, "That lipstick suits you". SUCCESS. Allison wore 107 in her Lily Collins inspired makeup video and I was all like, "QURL, IMMA NEED THAT SHADE" and yeah...I got that shade. 111 was sent to me by Shayne in our makeup swap (post coming soon!) and it's actually my first red lipstick! And since 107 and 111 are dry and matte formulas, I finally understand the dry lips/lip moisturizing/lip exfoliating problem, which led me to a weird session where I ended up making out with my Clarisonic a few weeks back. Anyways, 107 leans more wine/burgundy than berry, and is oh-so-appropriate for fall. Never in a bajillion years would I have imagined myself with that deep a lipstick shade on, BUT IT'S HAPPENING. 111 is orange-based red, and my mom literally said "whoah" the other day when I wore this in the house. Definitely not for the faint of heart, which is why I chicken out and dab + blot 343940834x before I actually see a person in real life. You know what else I need to get a grasp of? PRECISION. Now if you'll excuse me, I'm off to find some lip liners because I am piss poor at colouring within the lines. 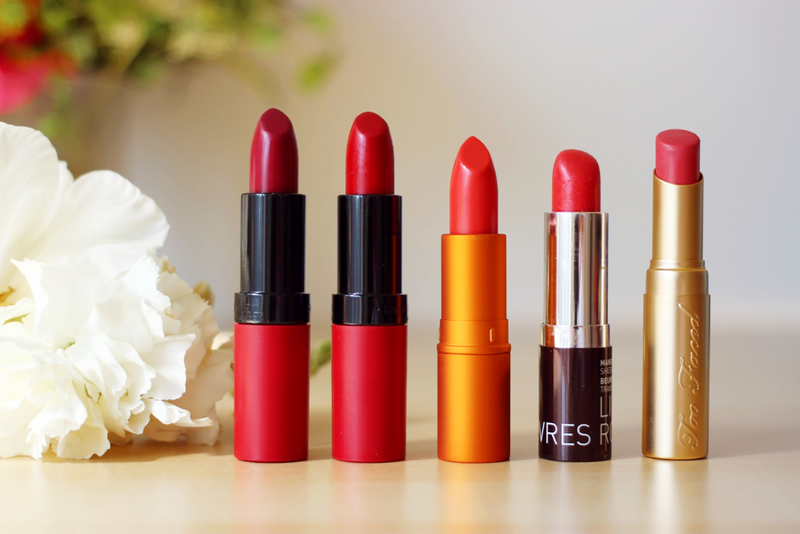 What are your favourite lipstick formulas/shades?